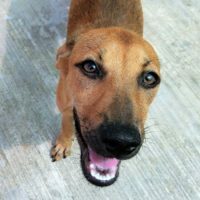 Latte is one of five “coffee pups” that were found running through the streets in Mexico, and was rescued as a baby. She is the most active of her siblings and is always on the go. She will need an active home to keep up with her love of walks and hiking. Latte’s leash manners are already smooth as silk and, with just a little training; she would make an excellent jogging companion. She’s very smart and learns quickly although she’s struggling with “personal space”. She just has too many kisses to give and so little time! She loves meeting new people so “down” is something she frequently gets to practice. No surprise: this girl rocked her cat test! Latte also loves to burn off energy playing with her dog friends and is being fostered with her sister Cappuccino. She would be cool to go to a home together with Cappuccino (who quiet and easy going), but Latte not-so-secretly dreams of being the only dog in her new home to satisfy her love or attention.